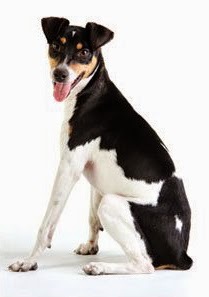 The Brazilian Terrier is a three colored dog related to the Jack Russell Terrier, and one of a handful of dog breeds native to Brazil. The breed stems back to the 1800s when Jack Russell Terriers were imported from Europe and bred with Miniature Pinschers and Chihuahuas. Brazilian Terriers are known for being perky, intelligent, and alert. They love to play, dig, bark, and romp around. They also have a strong hunting instinct and like to chase small animals. Being an intelligent and active breed, Brazilian Terriers need both physical and mental activity. They do best with experienced owners that can keep them occupied, and they need room to move. This is a great companion for a family who likes to hike, run, or power walk. Even with exercise, the dog is likely to be the first in the family to get up in the morning, and the last to fall asleep. This is a fairly common dog in its homeland, and rare outside of Brazil. Owners often keep a Brazilian Terrier to alert for intruders, and a Fila Brasileiro to take care of the intruders. When it comes to health, Brazilian Terriers have few hereditary problems and many live up to 15 years. They are easy to train, albeit very high energy dogs, and they don't require much grooming.